As-a-Service: Are you Missing the Big Prize? There’s a lot of noise in the market about the term as-a-Service right now. Often it’s taken to mean a new commercial model; essentially a way to drive cost down. While that’s certainly one benefit, the real prize is flexibility. That’s the real potential of the as-a-Service model: Increased agility, speed of change, and capacity to respond to your customers in a much more flexible way. If we look at the biggest disruptors in the past few years, such as AirBnB and Uber, we see their massive success is a result of their highly flexible as-a-Service model. Your organisation can offer its customers the same flexibility and responsiveness, but only if you in turn have maximum flexibility from your suppliers. 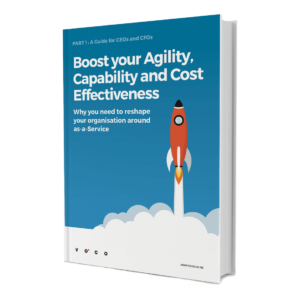 If you’re considering making the transition to as-a-Service, make sure you focus on the long term benefits of increased agility, otherwise there’s a danger your organisation will leave the big prize on the table. For an in-depth guide to your journey into as-a-Service, download our free ebook here.